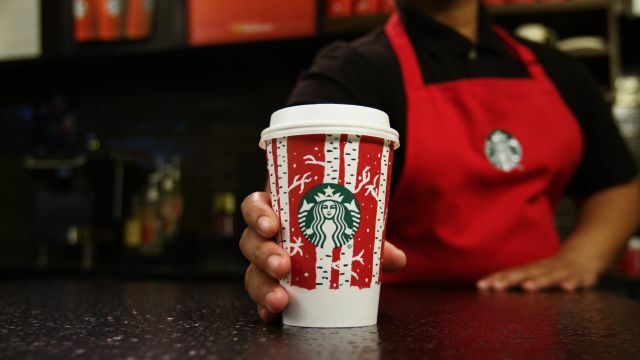 Starting today, Starbucks is running an end-of-the-year freebie where you can grab yourself a free Tall espresso beverage from 100 different locations each day, from 1 PM to 2 PM, through January 2, 2017 (excluding Christmas Day). They're calling the promotion, "10 Days of Cheer" and are throwing "Pop-up Cheer parties" at the select stores. In addition to the free coffee, participating locations will also be giving out Cheer Cards (AKA coupons) with discounts that can range from 50 percent off a Spiced Sweet Cream Cold Brew, Holiday Spice Flat White beverage, or lunch item to a free holiday cookie or Cranberry Bliss Bar with the purchase of any size crafted beverage. Espresso beverages include cappuccinos, mochas, lattes, macchiatos, and flat whites. The locations change every day but you can check for which stores near you are giving out free coffee each day at: www.starbuckscheer.com.